If you are like me and saw the incredible green E28 BMW 5 Series in the Mission: Impossible Fallout trailer and immediately caught the disease of desire for one, I have bad news. The movie comes out this week, it’s surprisingly great, and now everyone else is also going to want an E28. You would think BMW, which has a history of promotional tie-ins with spy movies for its new products, including the previous movie in this franchise, Rogue Nation, would want to peddle the new 5 Series in Fallout as the star of the show. And it’s there, but it gets no real action and definitely plays second-fiddle to the real star, which is clearly the E28. The Mission: Impossible franchise has always been a vessel for Tom Cruise to show off his immense ability as a physical actor, in the sense that he throws himself into some of the most impressive and intricate action sequences ever put to film in place of a stunt person. 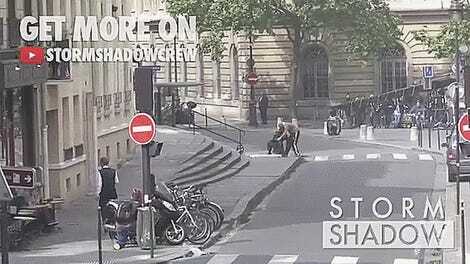 So it makes sense that if Cruise is doing his own driving through the streets of Paris for the latest movie, you’d want a car that not only shows him doing it, but also fits how completely badass he can make it look, too. And it is badass. The E28 car chase is only one element of a stunt-filled action-packed sequence that begins around a third of the way through the movie. The scene starts with Cruise’s character Ethan Hunt in a box truck, then has him chased down while riding a BMW motorcycle against traffic around the Arc de Triomphe, and then finally into the classic 5. 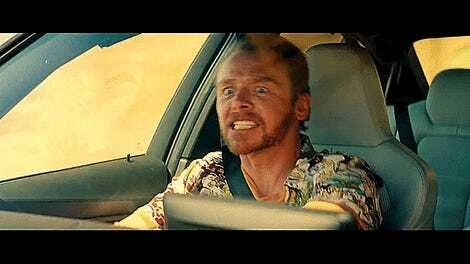 Then, as the trailer shows, Hunt is continued to be chased through Paris by Ilsa Faust (played by Rebecca Ferguson, who returns from the fifth installment) on a motorcycle, after Hunt orders the returning team of Benji Dunn (Simon Pegg) and Luther Stickell (Ving Rhames) to bail out. 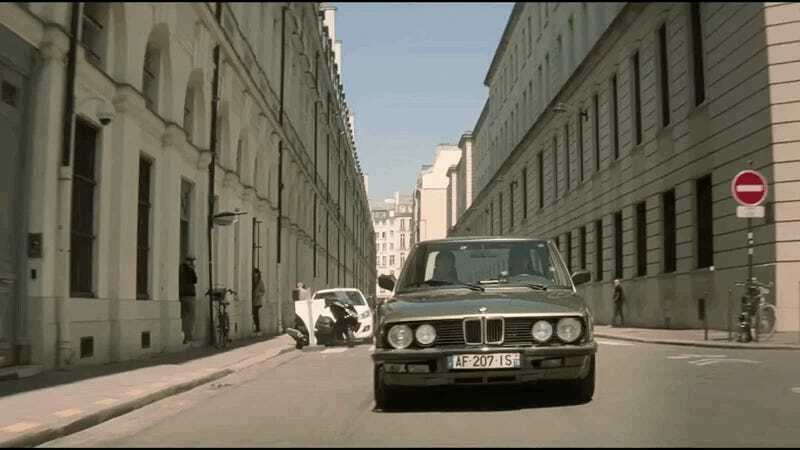 The E28 is masterfully maneuvered through the glowing streets of Paris, and the faded yellowish-green paint color is eye-catching as the car drifts through a cobble roundabout, squeezes between the pillars of the Bir-Hakeim bridge, rams through a motorcycle, and slides off of a flight of stairs. 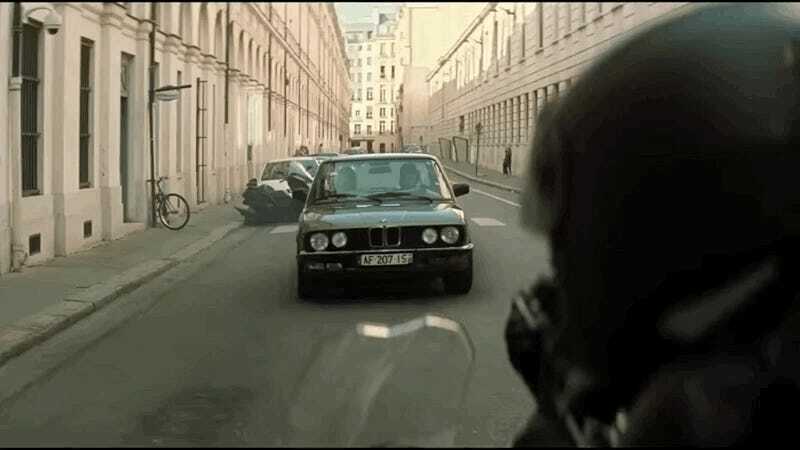 In any other action movie, the E28 chase would be enough to serve as the big third-act set piece, but in Fallout it’s only one of nine major stunt setups. It’s smack in the middle of a literal non-stop action thriller that includes an electrifying high altitude sky dive, two painful party fights, a prisoner breakout, motorcycle chase, ankle-breaking rooftop foot chase, dizzying helicopter dual, and a cliff-edge fist fight that will leave you hooked. The director spoke before the movie began at the press screening I attended Monday evening to make sure we were all aware of just how insane the stunts were. An entirely new oxygen mask had to be designed from scratch to make sure you could see Tom Cruise do the one-take skydive for real. The camera operator that jumped with him had to keep the lens focused on Cruise based on memory from over 100 practice jumps, as he couldn’t see what was being shot while falling out of the sky. As was widely publicized, Cruise broke his ankle during shooting of the rooftop chase (the take where it happens is kept in the movie), and the rest of the running scenes were shot before his ankle completely healed. He also trained 16 hours a day over six weeks to learn how to do his own helicopter stunt maneuvering, where it normally requires three months of training just to learn to fly. On top of all of that, he had to operate a helicopter-mounted camera during the stunts. There’s no doubt the man is genuinely unmatched in his motivation to entertain an audience, no matter what you make of his personal life. In the in-between parts from all of the stunt work is a fairly straightforward and serviceable plot to prevent nuclear anarchy, with plenty of twists and turns and some nice subtle callbacks to the previous movies. If you’re like me, you’ll be too busy trying to figure out how they pulled off everything to care. I’m still quite partial to the flair and style of the first Mission: Impossible movie, I love all of them (even the second one), and this one is perhaps objectively the best in terms of technical execution and stunt craft. If you thought they’d never top Cruise literally climbing up the side of the world’s tallest building, or hanging off the side of a plane mid-air, they top it at least twice in this one. Absolutely go see it, and absolutely try to find a good Craigslist deal on an E28 before everyone else does and we’re all stuck with ridiculous five-figure Bring A Trailer listings. Welcome to what should become everybody’s new favorite 5 Series generation.